Bit by bit over the last two decades, the University of Wisconsin–Madison’s iconic Washburn Observatory has been restored to its original sheen. 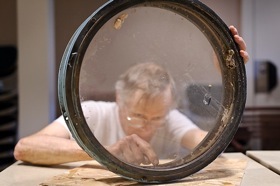 Antique-optics restoration specialist John Augustine lowers the 15.5-inch refractor lens from the Washburn Observatory telescope — which is temporarily suspended upside down. The dome was refurbished in the 1990s and the building itself was restored and updated in 2009. 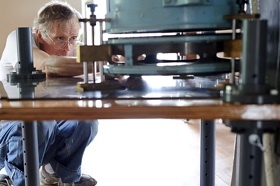 And this week, a final but crucial touch up — the cleaning and refurbishment of the glass lenses and the brass cell that holds them in the 240-inch-long telescope tube — was completed with the help of John Augustine, an antique instrument specialist from Parkman, Ohio. “There aren’t too many guys who do this kind of thing,” explains Jim Lattis, director of UW–Madison’s Space Place and the official custodian of the observatory and its antique refracting telescope. Augustine spent several days disassembling and cleaning the achromatic doublet lens, an assembly that weighs an estimated 50 pounds, using a series of distilled water baths and small brushes to free the elements of accumulated dust, debris and the occasional mud wasps’ nest. Augustine traveled to Madison this week where he spent several days extracting, cleaning and polishing the optics package that probably last saw thorough maintenance when the telescope was commissioned in 1881. A gift of Wisconsin Gov. Cadwallader Washburn, who directed that the 15.6-inch telescope lens be made equal to or slightly larger than a rival instrument at Harvard, the telescope at the time was the third largest refracting telescope in the United States and the fourth largest in the world. The refurbishment of the telescope’s optics package is being supported by a gift from Laura “Pat” Bautz, a 1967 graduate of UW–Madison. According to Augustine, cleaning the telescope’s optics package should occur on a 10-year cycle, but Lattis has yet to find records of any maintenance to that critical part of the telescope, and the difficulty with which the glass lenses were extracted from their brass frame suggests this week’s cleaning was the first since the observatory was constructed. But by Tuesday the lenses — one convex and one concave — were soaking in soapy water and Augustine was preparing to remove the tarnish from the brass doublet cell using ketchup, the optimal brass-cleaning agent. 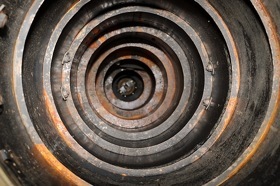 Concentric rings are pictured in a view looking inside the rusty-metal tubing of the Washburn Observatory telescope. The lenses of the Washburn telescope were made by Alvan Clark and Sons of Cambridge, Mass., at the time one of the world’s premier manufacturers of optics for astronomy: “You couldn’t do better than Clark. They made all of the biggest and best refractors,” notes Lattis, of the lenses then used to collect and focus light from stars, planets and other celestial objects. “They had surpassed the European makers,” including the German company that made the refracting lenses for the observatory at Harvard College. The optics appear to be in great shape, says Lattis. That’s good news for the folks willing to trek up to the observatory on the hill over Lake Mendota for the public viewing that occurs at least twice a month throughout the year.